The United States Environmental Protection Agency is coming under fire for failing to meet a deadline to start putting in place new rules to reduce ozone pollution. The rules were adopted by the EPA under the Obama administration to curtail ozone, a gas formed by emissions from factories when they come in contact with sunlight. The gas has been known to cause varying health problems, including asthma and lung disease. Under the regulations, adopted in October 2015, the standard for allowable ozone levels across the country was set at 70 parts per billion. That meant manufacturers would have to cut down on emissions for their geographical area to meet the criteria. 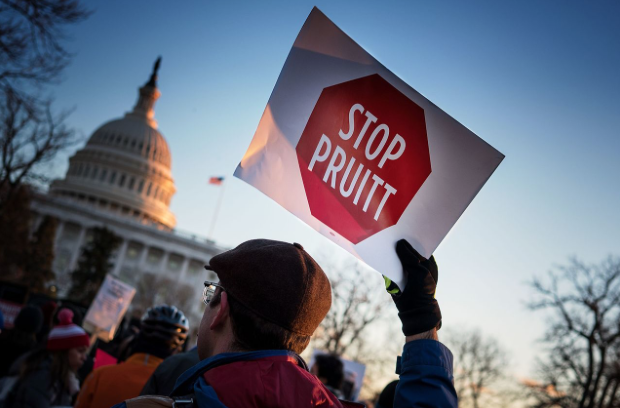 In August, 16 state attorney generals sued the EPA for delaying the implementation of the rules. A day after the suit was filed, the agency agreed to meet an Oct. 1 deadline to determine which parts of the country met the new standards. On Oct. 1, the EPA failed to publish its findings on what areas exceeded the standards. The agency’s insufficient progress has angered various environmental organizations. “EPA is continuing to work closely with the states to work through the designations process for the 2015 ozone standard,” the spokesperson said. The agency argues they have been working on different ways to combat harmful pollution, and that for the most part their work has payed off. “Clean Air Act programs have lowered levels of the six common pollutants: particles, ozone, lead, carbon monoxide, nitrogen dioxide and sulfur dioxide, as well as numerous toxic pollutants. From 1970 to 2015, aggregate national emissions of the six common pollutants alone dropped an average of 70 percent,” added the spokesperson. “It risks the health of millions of people and stalls required cleanup steps. And it’s why we’ll continue to use every tool available to make sure all Americans learn sooner rather than later — or possibly never — whether their air is dirty and endangering their health,” adds Walke.